Heart attacks in dogs are rare, but old dog heart failure is not. In fact, congestive heart failure (CHF) in older dogs is rather prevalent, affecting dogs around 7 to 8 years or older. Like kidney failure, congestive heart failure is not a disease in itself. It is the “end result” of some form of heart disease, making it difficult or impossible for the heart to pump enough blood to the whole body. As I just mentioned earlier, old dog heart failure is the end result of some form of heart disease. The most common heart disease that eventually causes CHF in dogs is mitral valve insufficiency (MVI), also commonly called “leaky valve disease”. About 80 percent of heart failure in dogs is caused by MVI. The mitral valve separates the heart’s left atrium and left ventricle. Under normal condition, the mitral valve closes when the heart contracts, preventing blood from “regurgitating” (going back) into the atrium. This way, all the blood goes to the body. When the valve doesn’t close perfectly, it creates a “leakage” – the blood goes backwards into the left atrium. Older small breed dogs such as Miniature Poodles, Shih Tzu, Maltese, Chihuahua and Pomeranians are more prone to MVI. Another heart disease that causes heart failure in dogs is dilated cardiomyopathy (DCM). DCM is a disease of the heart muscle, which results in an enlarged heart that does not function properly. Certain breeds are more susceptible to this heart disease. They include mostly larger breed dogs such as Doberman Pinschers, Boxers, Great Danes, Saint Bernards, Afghan Hounds, and Cocker Spaniels. Dietary deficiencies (e.g. deficiencies in collagen can result in heart disease; carnitine deficiency can cause dilated cardiomyopathy). Congestive heart failure in dogs is divided into four “classes” depending on the seriousness of the symptoms and progression of the failing heart function. Class 1: This is considered the early stage of CHF and the start of heart “malfunction”. Most dogs don’t show any outward signs so dog parents are most likely not even aware of the problem. This stage can last for years. Class 2: Dogs start to show symptoms of fatigue and shortness of breath, especially after exercise. At rest, they seem fine. Again, some dog parents may think that shortness of breath after exercise is “just” a sign of old age! Class 3: In this stage, even slow walking can cause the dog to breathe heavily and feel tired. Other signs may also start to show, such as a persistent unproductive cough, wheezing, bluish gums. Due to fluid accumulation in the chest area, breathing is constricted. To allow more air to get into the lungs, the dog may stand with their front legs spread wide apart, and lower and extend their neck. Class 4: This late stage can cause a lot of discomfort to the dog, even at rest. Fluid accumulation can affect the legs (resulting in swollen legs, difficulty walking), the abdomen (resulting in distended tummy, vomiting, lethargy), and the chest area (difficulty breathing). Although it may takes years for the heart failure to progress from Class 1 to Class 2, it takes a short time for it to go from Class 3 to Class 4. So, many dog parents are surprised and totally unprepared for the quick deterioration in their oldie’s health. Diuretics to remove accumulated fluids in the body because the heart is not moving them properly. Digitalis (or other heart meds) to strengthen (temporarily) heart muscle and improve heart function. Vasodilators to lower blood pressure. If breathing is difficult, oxygen is given to help improve breathing. You may notice that all these drugs do is to suppress the symptoms brought on by heart failure. They do nothing to slow down the progressive failing of the heart. Like any other health problems, it is best to adopt a holistic approach to treatment (getting the best of both worlds, so to speak). Sure, conventional meds can provide relief to discomfort and improve quality of life of the dog. 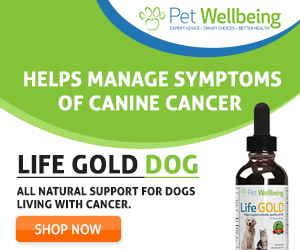 But, a lot more can still be done to help the dog, in the form of a better and more appropriate diet, supplements, and natural remedies such as herbs. If your oldie has some heart problem, consider using the herb Hawthorn, which according to G. Tilford (author of Herbs for Pets ) is the “queen of all cardiac tonics”. Hawthorn supports heart health in various ways. For example, it improves blood supply to the heart, stabilizes cardiac activity, reduces blood pressure, and generally works on balancing and enhancing heart function and performance. Holistic practitioners commonly use this herb to treat heart failure, high blood pressure, and arrhythmia. Hawthorn functions similarly to conventional heart medicine such as digitalis, but the herb is milder and safer. And it doesn’t have to be “one or the other” – Hawthorn can be used in conjunction with a lower dosage of digitalis. Motherwort is a cardiac tonic as well, but has the added property of being a sedative. So, if your oldie is stressed and tensed because of the heart problem, this herb can help support the heart and relax your dog at the same time! This Chinese herb supports heart function. Specifically, it supports the heart blood vessels and maintain healthy lipid (fat) levels in the blood. This herb is a diuretic, and the neat thing about Dandelion is that it is rich in potassium, so it replenishes the body with potassium that is being eliminated in the urine. Contrarily, diuretic drugs (e.g. furosemide) deplete potassium from the body, and the dog may have to take a supplement of potassium. Nettle is another diuretic herb that is high in minerals, including calcium and potassium. This Young At Heart herbal formula contains herbs such as Motherwort, Nettle, Fo-Ti, and more. It supports healthy heart function, strengthens heart muscle and blood vessels, and promotes good blood circulation. Many dog parents have used this herbal formula with their dogs with heart failure and got good results. In the past, dogs with CHF were put on a low-protein low-sodium diet. Now we know that restricting protein is not necessary. In fact, a low-protein diet can cause more harm than good. Why? Because dogs with CHF very often lose their fat and lean body mass. They need high-quality protein to prevent this condition. Also, since sodium can cause fluid retention, many doctors and vets are of the opinion that sodium restriction is necessary for all CHF patients. But, research has found that sodium restriction could actually be detrimental to such patients. Some holistic vets and canine nutritionists suggest that strict sodium restriction is only necessary if a dog with CHF has fluid retention (ascites). Protein: Feed slightly higher level of protein. Be sure to use high-quality animal protein sources (e.g. chicken meat, turkey meat, beef, fish such as salmon, eggs, organ meats such as beef heart, etc. ), preferably raw or home cooked. If you cook the meat, don’t cook for too long as high heat can destroy taurine, which is necessary for heart health in dogs. Fat: Fat should be moderate especially if your oldie is a bit on the chubby side. If the dog is overweight, it puts more burden and stress on the old heart! Vegetables: If you don’t feed raw bones, add steam veggies to the diet for fiber, such as broccoli, dark leafy greens, carrots, sweet potato, etc. If you cannot cook for your oldie for whatever reason, find a high-quality grain-free commercial diet that has high-quality animal protein sources as its first 2-3 ingredients. You can also add fresh proteins (e.g. scrambled eggs, lightly-browned ground beef, low-fat yogurt) and steamed veggies to the food as toppings. 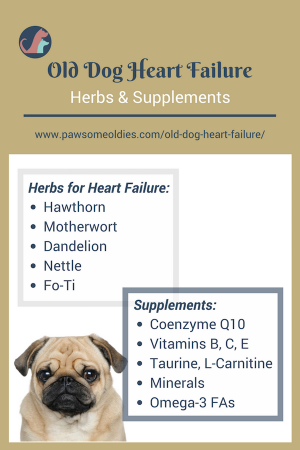 Dietary supplements are important as they help old dogs with heart failure by maintaining good circulatory health. Vitamin B complex is extremely important when it comes to heart health. A deficiency can cause poor nerve conductivity to the heart and weakening of the heart muscle. Vitamin C is beneficial to heart health because it helps maintain and strengthen blood vessels and heart walls. Vitamin E has antioxidant properties and has been shown to have beneficial effects on heart muscle health. Studies have found that coenzyme Q10 (CoQ10) can strengthen heart muscles, and has the ability to treat CHF in humans. Foods rich in CoQ10 include beef, salmon, mackerel, sardines, and spinach. Coenzyme Q10 can be found in the cells of the heart and liver, but the bad news is, for some reason, patients with heart disease have low CoQ10 in these cells. So, supplementation is highly recommended for dogs with heart failure. Studies on the positive effects of Omega-3 fatty acids on heart health in people are inconclusive, some results suggest positive effects, others neutral. But it’s a fact that fatty acids are essential to all living cells as they help repair old cells and produce new ones. And since fatty-acid-rich oil such as salmon oil is safe and beneficial to the overall health, it doesn’t do any harm in giving this to your old dog with CHF. These two amino acids are essential for heart health. They help strengthen the heart muscle and can help reduce fluid accumulation in the body as well. Taurine and L-carnitine are found to be especially helpful for dogs with dilated cardiomyopathy. Some diuretics (e.g. Lasix), if used long-term, can cause potassium deficiency. This can result in loss of appetite and weakness, and in serious cases, the heart will stop beating (cardiac arrest). If your old dog with CHF is on a diuretic medicine, ask your vet if potassium supplementation is needed. Some other trace minerals that are important for heart health include magnesium, which helps dogs with arrhythmia (irregular heartbeat), and works together with calcium to strengthen the heart. Selenium is also a heart-supporting mineral. A study shows that selenium, combined with Coenzyme Q10, cuts heart disease deaths in people by a whopping 50%! 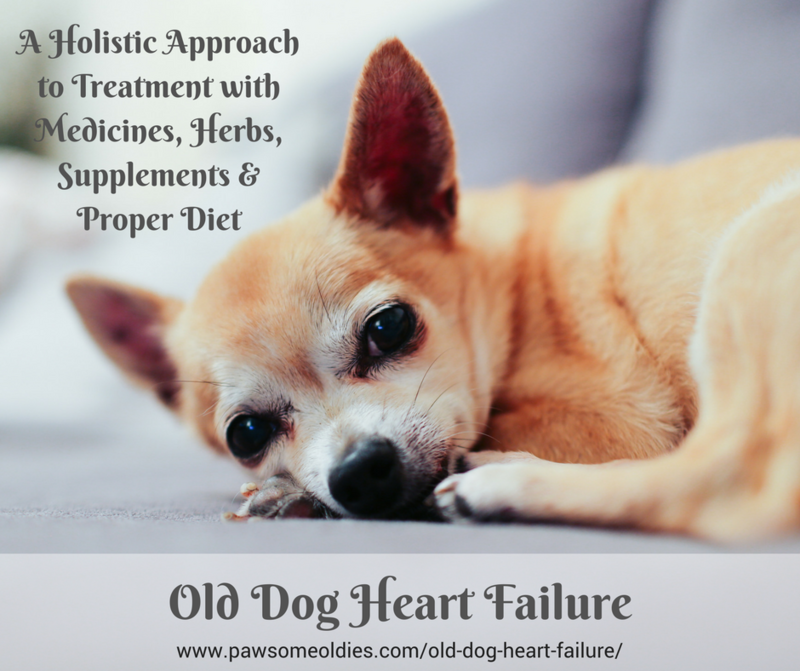 Using a holistic approach to treat old dog heart failure can get the best of both worlds. 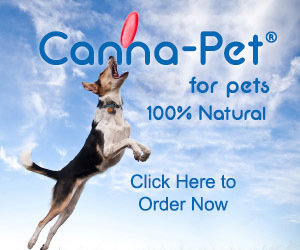 Herbs and supplements and a proper diet may eventually enable your dog to take a lower dosage of conventional drugs. Work with a holistic vet to design a treatment protocol that best suits your dog.